​Phenomenal star Maine Mendoza graces the iPhone X Midnight Launch party on December 1, 2017 as the newest Power Mac Center brand ambassador. (left) As a surprise, she hands over the iPhone X to its very first customer. (right) Mendoza is unboxing her special iPhone X package, which comes with premium accessories available at Power Mac Center stores. It’s finally here! Power Mac Center has officially launched the most anticipated iPhone X, widely regarded as the most sophisticated iPhone yet. At the stroke of midnight on December 1, 2017, the premier Apple partner re-opened the doors of its flagship store in Greenbelt 3, Makati City to welcome shoppers who lined up early the previous day to be among the first to get their hands on today’s hottest device. Before the selling started, guests were treated to free crash courses as well as live music mixes from DJ Callum. Among the Power Mac Center brand ambassadors who graced the event were Maine Mendoza, Marc Nelson, Rico Blanco, Gab Valenciano, Sam YG, Jinno Rufino, Kim Jones, Jericho Rosales, Tommy Esguerra, Cesca Litton, Richard Juan, and Kaila Estrada. Meanwhile, the first 200 buyers received premium accessories worth up to P23,000 each! iPhone X is now available in select Power Mac Center stores nationwide. Price starts at Php64,490. Premier Apple partner Power Mac Center launches the iPhone X at midnight on December 1, 2017 in its flagship store in Greenbelt 3. iPhone X is now available in select Power Mac Center stores nationwide. Price starts at ₱64,490. ​Filipino Apple fans eagerly wait in long lines to show support for the iPhone X as it launches in Power Mac Center Greenbelt 3 on December 1, 2017. Hitachi Vantara, a wholly owned subsidiary of Hitachi, Ltd., recently released its key business and technology trends for Asia Pacific in 2018. These trends are jointly predicted by Hubert Yoshida, chief technology officer, and Russell Skingsley, chief technology officer Asia Pacific. The adoption of Internet of Things (commonly referred to as IoT) platforms will dominate enterprise IT strategies in 2018, alongside a number of other areas. Yoshida and Skingsley have identified ten key trends for the Asia Pacific technology market in 2018. “Enterprises should look for an IoT platform that offers an open, flexible architecture that simplifies integration with complimentary technologies and provides an extensible “foundry” on which to build a variety of industry applications that companies need to design, build, test, and deploy quickly and with minimal hassle,” added Skingsley. “Hitachi Content Intelligence can extract data from the silos and pump it into workflows to process it in various ways. Users of Content Intelligence can be authorized so that sensitive content is only viewed by relevant people and document security controls are not breached. Content Intelligence can create a standard and consistent enterprise search process across the entire IT environment. It can connect to and aggregate multi-structured data across heterogeneous data silos and different locations and provides automated extraction, classification, enrichment and categorization of all of an organization's data,” said Skingsley. 2018 will see a growth in analytics and artificial intelligence (AI) across the board as companies see real returns on their investments. According to IDC, revenue growth from information-based products will double the rest of the product and services portfolio for a third of Fortune 500 companies by the end of 2017. Yoshida believes that video can provide unique functions like egomotion – 3D motion used in autonomous robot navigation – behavior analysis and other forms of situational awareness. “Even when data centers used technology to create shared data repositories to break down the data silos, the different functions were still focused on their own objectives and not on the overall business objectives. Now with cross functional teams using iterative agile sprints of two to four weeks, IT can focus on relevant business outcomes and deliver it more efficiently,” said Skingsley. Under the leadership of Chief Information Officer, Renee McKaskle, Hitachi Vantara has been using agile methodologies over the past two years to drive digital transformation, and the results have been highly impactful. 2018 will see new challenges in data governance which will require organizations to implement new frameworks. The biggest challenge will come from the General Data Protection Regulation (GDPR), which will give EU residents more control over their personal data. This regulation will drive up costs and increase the risks involved in collecting and storing personal data. Violations of the GDPR could face fines totaling up to $21.75 million, or 4% of EU’s total annual worldwide turnover of the preceding financial year. “Previous data governance was based on the processing of data and metadata. New data governance must now consider data context. If a user invokes their right to be forgotten, a company must be able to locate that individual’s data, eradicate it and provide proof that this has been done. GDPR’s mandatory breach notification of within 72 hours also means organizations face a very short window to respond. The ability to do this is impossible if the data is scattered in different application silos and cannot cover data stored on mobile devices or in the cloud. In 2018, data governance frameworks will need to be updated to include content intelligence tools,” comments Skingsley. “In reality, most of us use the same password for the accounts that we don’t think are very important. Unfortunately, hackers also know this, so once they discover a password, they will use it to successfully hack other accounts. Businesses are coming to the realization that proxies that represent our identity - like passwords, ATM cards, and pin numbers - even with two-factor authentication, are hackable,” says Skingsley. “Producers and consumers can no longer survive in the digital world with this traditional approach to value creation. In the digital world, the pace of change is relentless and problems span across multiple domains, with a blurring of industry domains and boundaries. Producers cannot take years to develop a solution and consumers cannot plan their business on multi-year roadmaps that may not deliver what they need. If consumers and producers are to innovate, they must be active participants in the value creation process as co-creators,” comments Yoshida. For further insights into the top IT trends for APAC, please sign up here for the upcoming webcast which will take place at 11:00 a.m. (HK/SG time) on December 12, 2017. STAUNCH ENERGY DEFENDER: Energy Secretary Alfonso Cusi with Assistant Secretary Robert Uy and Senior Undersecretary Jesus Cristino Posadas and UNIDO's Representative Tonilyn Lim conferred the Special Recognition Award to Senator Sherwin Gatchalian during the 35th Don Emilio Abello Energy Efficiency Awards (DEAEEA) held last 7 December at the Passion Restaurant, Maxims Hotel in Pasay City. The prestigious award is given to an individual who served the country through honed, crafted knowledge and talents on energy efficiency and conservation. The Department of Energy (DOE) honored over 170 establishments and energy stakeholders during the 35th Don Emilio Abello Energy Efficiency Awards (DEAEEA) on 7 December 2017 at the Passion Restaurant, Maxims Hotel in Pasay City. Energy Secretary Alfonso G. Cusi together with Undersecretary Jesus P. Posadas, Assistant Secretary Robert Uy, and Mr. Gerry Manares, Chairman of DEAEEA Technical Evaluation Committee conferred the awards in seven (7) categories: Special Recognition Award to an Individual, Secretary’s Award, Hall of Fame Award, Outstanding Award and Outstanding Energy Managers Award, Citation Award and Special Award. Special recognition was also given to ASEAN Energy Efficiency and Conservation Awardees, the top ten performers in the Government Energy Management Program (GEMP), experts and implementers of Energy Management Systems. “Energy efficiency is but a small part of our efforts to forge an environmentally sustainable energy sector,” he added. 2. Pavilion Mall/ Jesus V. Nacubuan, Jr.
15. San Miguel Yamamura Packaging Corp. Metal Closure & Lithography Plant San Fernando Pampanga/ Marciano P. Payumo, Jr.
45. KGB Building/ Julian C. Cuartero, Jr.
47. Maybank Corporate Center / Felipe A. Ladignon, Jr.
61. Holcim Philippines, Inc.-Bulacan Plant/ Samuel O. Manlosa, Jr.
62. IBM Philippines, Inc. -Building J / Nicasio Bordeos, Jr.
63. IBM Philippines, Inc.-Two Evo Tech Building/ Nicasio Bordeos, Jr.
16. Tower One & Exchange Plaza. 18. ON Semiconductor SSMP Philippines Corp.
3. Shell Shared Service (Asia) B.V.
15. BPI-Philam Life Alabang Condo Corp.
8. Continental Temic Electronic (Phils), Inc. The DOE also recognized the newly certified National Experts on Energy Management Systems (EnMS) as well the companies who have installed the EnMS under the DOE-Philippine Industrial Energy Efficiency Project (PIEEP). These include Job Jacob Gonzales, Desiderio Caliba, Erick Estiller and Val Gregana who were trained by international experts of the United Nations Industrial Development Organization. Energy Management System Project Implementers of the EnMS include Chowking Highland Commissary, Sucat Plant; Chowking Highland Commissary, Muntinlupa Plant; Tong Hsing Electronics (Phils), Inc.; and Coca-Cola FEMSA Philippines, Inc.-Canlubang Plant. The 35th DEAEEA winners have been carefully selected by the members of the Technical Evaluation Committee composed of the DOE, Pilipinas Shell Petroleum Corporation, MERALCO, Petron Corporation, Philippine National Oil Company, National Power Corporation, Energy Practitioners Association of the Philippines, Philippine Energy Conservation Center, Inc., Energy Development Utilization Foundation, Inc., and Chevron Philippines. The DEAEEA was named after Don Emilio Abello, a pioneer in the enercon movement whose commitment to the conservation of energy was demonstrated through prudent policy formulation and an intensive information drive. These efforts gave birth to the DEAEEA that honors outstanding performers in energy efficiency and conservation in the business, industrial, commercial and power sectors, as well as individuals with exceptional contributions in energy management. “E-SAVING” EXCELLENCE AWARD: Energy Secretary Alfonso Cusi together with DOE Senior Undersecretary Jesus Posadas, Assistant Secretary Robert Uy and Technical Evaluation Committee Chair Mr. Gerry Manares presented the Secretary's Award to the representatives of San Miguel Yamamura Packaging Corp. - Manila Plastics Plant during the 35th Don Emilio Abello Energy Efficiency Awards (DEAEEA) held last 7 December at the Passion Restaurant, Maxims Hotel in Pasay City. The Secretary's Award is the highest recognition to be conferred in the ceremony and is given to a former Hall of Fame awardee with the highest Percent Energy Conservation (PECO) rating of not lower than 15%. Award-winning female comedian Euguene Domingo comes back to theater reprising acting on a play shecwas once involved in. Butvshe wasn't playing thevrole of the daughter back then but the mother. This time she plays the role of the "miserable with her life" daughter with that urge to end her life. Ironically, her character relates the whole idea with her mother who, at the excerpt, pervently tries to convince her otherwise. This could mean her character is just trying to call attention to herself. Suicidal tendencies could be visible but those whonhave seen other adaptations of 'Night, Mother could shed some light on these questions. I never do research before attending a media launch or preview. It would prevent me from expecting too much or too little as I do want a fresh perspective. Sinxe times also change, the adaptations also evolve and are sometimes cuztomized to catch up with today's realities. I was undoubtedly surprised learning that I was not watching a comedy eventhough Eugene Domingo was the lead actor. But I shouldn't have reacted that way now that I know her roots was in theater. True enough, Uge has come a long way from her theater origins. Her shift towards television and movies never stopped her from returning to her true love - the theater. She now performs at PETA Theater Center for 'Night, Mother, an adaptation from an existing play. I have to commend PETA for their various offerings. I do hope many would support their shows as they are definitely worthe the time. For actors lije Eugene, there is so much discipline in theater as compared to mainstream relevision and movies. Fir me, theater is where we would see a lot of professionals seekibg to satisfy their thirst for true acting. Stuff like memorizing a 72-page script, quick-thinking for ad libs all throughout the play (in this case 90 minutes), and catching fellow actors when they fail to deliver lines, are just some of the skills and discipline that you'll learn from being a theater actor. Itbis not easy, but it challenges them to what they are capable of doing. We also have a quick interview and shout-out with her uploaded on our social media pages. The play will be running from February 2 to March 19, 2018 so be sure to include it on your calendar for next year. Amidst the perception that the agency is not moving forward with the supply of license plates, the Land Transportation Office (LTO) Chief, Assistant Secretary Edgar Galvante, is on top of the situation and is proceeding with the procurement of license plates with dispatch and in accordance with existing procurement laws. The matter was raised during the House of Representatives Committee on Transportation meeting on 06 December 2017 which he was unable to attend due to his hospital confinement since Tuesday, 05 December 2017. It will be recalled that the 2013 procurement of Motor Vehicle (MV) /Motorcycle (MC) plates was questioned before the courts and the Commission on Audit, and these cases remain pending to this day. Said procurement should have covered the supply of license plates from ‎2014-2018. Moreover, in June 2016, the SC issued a temporary restraining order preventing the LTO and the Department of Transportation and Communication from releasing and distributing 700,000 license plates turned over by the Bureau of Customs after the plates' supplier-importer failed to pay the required customs duties. Thus, when the present administration came in July 2016, there was no budget allocation for procurement of license plates for 2016, 2017 and 2018. Unconvinced that the procurement of license plates is dependent on the resolution of the cases involving the previous procurement, ASec Galvante then requested for additional funds to be included in the LTO’s 2017 budget in the amount of P400 million in order to proceed with the procurement of license plates. Sometime in November 2016, DOTr Secretary Arthur P. Tugade approved the request and set aside the amount of P1 billion from DOTr’s budget for LTO’s procurement of license plates. The LTO clarified that the agency has already issued the notice of award (NOA) to the winning bidder in the procurement of license plate in the amount of P978.8 million on 01 December 2017. The winning bidder, Trojan Computer Forms Manufacturing Corporation and J.H. Tonnjes E.A.S.T. GmbH & Co. KG Joint Venture, has already been required to provide the performance security. Initial delivery is expected sometime in March 2018. The LTO assures the public that the agency is doing the best it can, in compliance with existing laws and regulations, to deliver the license plates. There are only just a couple of weeks before Christmas day. And while some may already be trapped in a Christmas rush or the “holidaze,” Christmas at the Araneta Center continues to make spirits bright. Aside from being one of the top destinations for those looking to buy Christmas presents or ornaments, Araneta Center has a full lineup of exciting activities that will make sure spending the Yuletide season here will be worthwhile. “Jingle Bell Rock” may be one of the most popular Christmas songs, but at the Araneta Center, the public can rock with the hits of some of the country’s biggest musical acts in “Alab ng Puso,” a free concert at the Times Square Food Park on Saturday, December 9 at 4 p.m. The concert, which celebrates human rights, will feature performances from Sandwich, Noel Cabangon, Cookie Chua, Gary Granada, Aia de Leon, Tanya Markova, and spoken word artists Alfonso Manalastas and Juan Miguel Severo. In a bevy of Christmas shows, is it still possible to find one that is entertaining as it is fresh and new? Turns out, it is. Impossible, the world’s greatest magic show, comes to Araneta Center for the holidays. The show will run from Christmas day, December 25, 2017 to January 3, 2018 at the Araneta Coliseum. Ben Hart and Magical Bones, two of the magicians on the show, have earlier visited the country and thrilled Filipinos from all walks of life with their impressive tricks. Hart has earned a reputation for his unorthodox methods, while Bones has built a name as the world’s “best hip hop magician.” Joining the two are Ali Cook, Chris Cox, Josephine Lee and Bello Nock. Tickets are now available. For reservations and more information, visit TicketNet.com.ph or call 911-5555 or 374-9999. Dubbed as one of the most “Instagrammable” sites this Yuletide season, the Times Square Food Park serves as the bigger and better location of the iconic Araneta Center giant Christmas tree and the new tunnel of lights. It also houses stalls that sell various food items and beverages—truly a perfect bonding spot for families, friends and couples. As an added treat, there are fireworks shows every Fridays and Saturdays of December. 4. Santa Claus (and more) is in town! Who wants to get stuck in a mall full of restless bargain hunters? Fortunately, this is not the case at the Gateway Mall, Ali Mall and New Farmers Plaza. Aside from being a top choice for those looking for gifts for their loved ones, the three malls also offer a respite to shoppers with chorale performances every day of December. Santa Claus also roves around the three malls to spread the Holiday cheer and pose for photo-ops with Christmas shoppers whether they are naughty or nice. While some may be caught up with the hustle and bustle of the Christmas rush, many more make sure that they do not forget the true essence of the season. The tradition of Simbang Gabi or Dawn Masses lives on at the Araneta Center with Gateway Mall, Ali Mall, New Farmers Plaza and Farmers Market providing the public a convenient venue for the Masses to remember the birth of Jesus Christ. Whether it is a “silent night” or a season filled with “joy to the world,” Araneta Center’s Christmas activities are a gift to the senses and the spirit. Azkals grabs second place in the recently concluded CTFA Invitational Tournament held in Taipei from December 1 to 5. In spite of an undermanned team, and three-day preparation - the quickly assembled Azkals composed of a few veterans, players from the U22 SEA Games squad and University stand out squeezed a second-place finish ahead of Timor Leste and Laos. Most of the regular Azkals were not available because they we not released by their Clubs due to the PFL season is in its semi-finals stage. The CTFA Invitational Tournament dates are also outside of the FIFA dates so a number of call ups on foreign based Filipino players were not successful. “If this is accurate, I am surprised with the comments of Dan (Mr. Palami). We are working for the same organisation which is the PFF, and representing one country, Our Country. I think a more encouraging and supportive stance will do more good for Philippine Football than complaining and maligning the players and coaches who did their best for their country. I think whoever makes these negative statements are being unfair. We ended up second place with 3 days preparation, the players were given the best organisation one can possibly do with the time, and logistics constraints we have plus the conflict that the CTFA Tournament have with the PFL schedule. My role is temporary as the PFF Secretary General asked for assistance because most of the Clubs with the regular Azkals players including Mr. Palami’s Global FC are in the PFL semi-finals hence the Clubs prioritise the League instead of the National Team that is why they did not release the players. The regular Azkals Coach Thomas Dooley also had a very important previous commitment to speak in an AFC event representing the PFF. Mr. Palami suggested certain players, we contacted them even bought them airline tickets but they did not come for some reason. During the Tournament were some calls and red cards that did not go our way which could have changed the complexion of the games and the result of the Tournament. I am not offering any excuses as there are none needed. The Players and Coaches did their best and what is important is they were there on the field fighting. We had three days to prepare and the players coming in from a long hectic PFL schedule, a 2nd place finish is descent under the circumstances. Just like every year, Octo Arts Films has a movie to offer featuring the Bossing himself. But unlike next year when they failed to get in to the festival, now they are back with a big bang as a different leading lady joins their lead comedian as headliner of the movie entitled Meant to Beh. For the movie, bloggers were invited to a blogcon with Vic Sotto, Dawn Zulueta, JC Santos and Direk Chris Martinez attendibg the event. There are several celebrities included in the cast but only the three and their director. As usual, Vic was cool and composed at the Meant to Beh blogcon. He always projects himself as graciously decent eventhough he cracks a joke every now and then. His antics during the introduction started some laughter and consistently was there during the Q&A with the bloggers. Their movie is also something new for the comedian since the plot deals with some family struggles specifically the "disenchantment" between husband and wife, and the temptations that surrounds. Opposite Dawn Zulueta, plus an additional cast of younger actors, including child star Baste, and not to forget their usual extras from Eat Bulaga Dabarkads, the movie still somehow uses tried and tested formulas of showbiz. Does true love stand the test of time? This is explored in “Meant To Beh” the latest blockbuster film starring Vic Sotto and Dawn Zulueta. During the holiday season, happy families and loving relationships are highlighted amongst the merrymaking of the holidays. With Meant To Beh, moviegoers are treated to this funny and poignant story about the Balatbat family, where they can pick up timely lessons about life and love along the way. Middle-aged couple Antonio (Vic) and Andrea Balatbat (Dawn) try their best to raise their three children, Christian (JC Santos), Alex (Gabbi Garcia), and Riley (Baby Baste). The Balatbats have a perfect family setup despite the fact that the couple was only forced by their parents to get married when they were younger. These and other issues arise through the years, creating challenges and hardships that threaten the harmony within the family and eventually lead to a point where the couple, realizing that they never really loved each other, decides to separate in order to find themselves. This decision breaks their children’s hearts and they devise way to get their parents back together again despite both finding new respective partners. It has become their mission to get their parents to fall in love. The movie, which also stars Sue Ramirez, Ruru Madrid, Andrea Torres, and Daniel Matsunaga is directed by Chris Martinez for Octoarts Films, M-Zet Productions and APT Entertainment. Meant To Beh: Ika-Something na Utos will make its premiere in Philippine cinemas on December 25, 2017 as one of the eight official entries of the 2017 Metro Manila Film Festival. I've won more than a dozens of world trip. 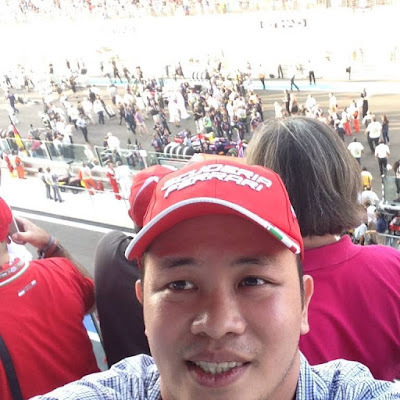 Including major world sporting events like World Cup, Lemans, MotoGP, Festival, Racing, Beerfest, Ski, Disney and several F1 world race trip-tours. Most of it are coming from easy online contest. So here's my tips to fulfill your dream of travelling around the world the fastest and easiest ways. They may say that there's a travel bucket list, but the truth is when we get to appreciate the beauty of travelling. It may sound that my travel bucket list is already fulfilled. And guess what its still not. So here's what I'm still working on NBA Finals, Ryder Cup, Champions League, Superbowl, Wimbledon, Masters, Nascar, The Hobbit, Euro Luxury Cruise, Indianapolis 500, Floyd TBE Boxing Club, Las Vegas Main Boxing Events, UFC Main Event, Hanging out with World Champs, Hollywood, 007 Movie Scenes Trip, Monaco Glitz and Glamour OMG its a lot more. The largest global sports media property in Asian history, ONE Championship™ (ONE), recently hosted the ONE: WARRIORS OF THE WORLD Official Face-off on Wednesday, 6 December atop the 61st floor of the Vertigo Restaurant in the Banyan Tree Bangkok Hotel in Bangkok, Thailand. In attendance was ONE Championship President of Thailand, Mr. Kamol ‘Sukie’ Sukosol Clapp and main event competitors Yoshitaka Naito and Alex Silva, as well as co-main event competitors Shannon Wiratchai and Rasul Yakhyaev. The rest of the athletes also faced off. Alex “Little Rock” Silva of Sao Paulo, Brazil, is a second-degree black belt and Brazilian jiu-jitsu world champion feared for his relentless pursuit of submission finishes. Silva is riding high on a five-bout winning streak, rapidly climbing ONE Championship’s stacked strawweight ranks. He is a technical grappling specialist with a penchant for securing highlight-reel submissions. With steadily increasing confidence, Silva’s last five victories have all ended in spectacular fashion. In his most recent contest, Silva made quick work of the highly-regarded and previously unbeaten Hayato Suzuki, earning him an opportunity for the ONE Strawweight World Championship. NEC and Hortonworks have strengthened their partnership to bring quality Data Management Platforms to increase efficiency in handling Big Data workloads. NEC Philippines along with Hortonworks conducted a roundtable in Shangri-la Hotel, Makati, gathering different IT Professionals, industry executives, and industry giants in the Philippines to shed light on the importance of understanding Big Data analytics and how to utilize them for their respective industries, especially for Enterprise customers. “The NEC-Hortonworks partnership aims to provide solutions and create insight into the key factors to being competitive and driving our companies to further growth,” NEC Philippines President Elizabeth Pangan said. “In this partnership, NEC is committed to provide the best Hadoop platform for data management processing. As part of this solution, NEC brings specialized hardware that is designed and optimized for Big Data workloads,” Pangan added. The partnership combines NEC's "Data Platform for Hadoop" with Hortonworks Data Platform to allow enterprise customers to process structured and un-structured data on a single platform. Hortonworks Data Platform is optimized with NEC’s Server hardware, such as the DX2000 which can be fully customized for a variety of Linux Operating Systems to meet the needs of the enterprise market. The roundtable was fruitful and informative as the executives listened to talks about The Art of Data Science, Getting Into the Data Driven Economy, Delivering Faster Analytics at Scale, and Hortonworks Data Platform End-to-End Solution. Both NEC and Hortonworks are committed to deliver quality support in addressing technical concerns enterprise customers might have with this Large-scale Distributed Processing Platform. Fern. Releases Debut Single “Into You” and Peaks at # 1 on Spotify! 17-year-old singer-songwriter-producer Fern. releases debut single “Into You” under Universal Records and immediately peaked at # 1 on Spotify! Universal Records is more than proud and elated to announce that the debut single “Into You” peaked at number 1 on Spotify shortly after its release, and still maintains its position up until now. Fern.’s single, “Into You,” is now released on all digital platforms, to be followed by his debut EP this 2018. To our distinguished guests, friends from the media, DOE management and staff, Good morning! We must all be proud of what we have attained so far as a result of strenuous discussions, exchanges and revisions. The government and private sector working together towards a common goal that is for the common good of the industries and the consumers as a whole. The Revised Retail Rules, The Philippine Downstream Natural Gas Industry Regulation and Handbook on LPG Safety Code in Refilling Plant are a welcome development in its respective sectors. For one, we now have categories for gas stations that will serve, among others, as basis of additional facilities and services. We are also open to the various technology-options that are being introduced in the market to address the proliferation of liquid fuels in soda bottles or “bote-bote” and to cater the dynamic segment of the transport industry, the tricycles and those living in remote areas. Furthermore, the DOE and the Downstream Oil Industry have already drafted and endorsed to the DTI BPS for issuance of the new PNS for Biodiesel blends of both Automotive and Industrial Diesel Oils to comply with the standard specification under the Philippine Clean Air Act. These are potent measures to encourage the entry of new industry participants and to address or at least minimize the noted infractions being made by unscrupulous entities. Need I say that we must not lose sight of our partnership, that we need to jointly monitor and for each industry stakeholder to exercise self-regulation. So, what is the bottom line? These issuances generally put in place the requirements for ease in doing business and reiterate and identify the national standards on quality and quantity that is, for the protection of consumers’ welfare. As what we have always been advocating, safety comes first and there is no compromise on that. While the industry is deregulated, government must ensure that all stakeholders abide to the laws, rules and regulations governing the business especially, on safety. We all know that this does not stop here. In fact, there are still a lot of things to do and we appreciate your continued support on the more urgent additional rules. For one, the need to review and eventually update the compliance to the Biofuel requirements on Ethanol and CME blends. Secondly, a Joint Administrative Order (JAO) is planned to be issued on the first quarter of 2018 directing all LPG Industry participants to observe minimum safety standards in the transportation and distribution of LPG in Cylinders. It was crafted to apply to all persons involved in importing, refining, refilling, storing, transporting, marketing, distributing, hauling, retailing, selling, and/or trading of LPG in cylinders. The LPG Industry participants are enjoined to adhere to and observe strictly the guidelines and all the submissions and compliances that are prescribed and mentioned in the said JAO. In order to effectively implement the provisions in the circular, the proposed JAO is promulgated for the information, guidance and compliance of all concerned. This measure shall be made in coordination with our partner agencies such as DILG, DOTr-LTO and MMDA who are directly involved in the regulations of vehicles transporting petroleum products. And the last but not the least, a Department Circular on the Unbundling of Oil Price Adjustment is being prepared that is seen to enhance the availability of information regarding the details of any oil price adjustment including the reasons for such. It shall also mandate the direct explanation of the adjustment by the respective oil companies and the requirement of specifying the date when the price adjustment from the biofuel shall be effected. It shall be released on the first quarter of 2018. This sums up what we have accomplished to date and what we need to finish in the early part of 2018. As we endeavor to put order in these industries, we again call on you to join us in pursuing and championing it. Thank you and Good Morning! OIL CONSUMER DAY: All smiles as the Department of Energy (DOE) celebrates Oil Industry Management Bureau (OIMB) Day as part of the National Energy Consciousness Month (NECM). Energy Secretary Alfonso Cusi together with DOE Undersecretary Donato Marcos, Office of the Secretary Director Cesar Dela Fuente, OIC for OIMB Director Rino Abad, OIMB Assistant Director Rodela Romero, other DOE officials, representatives from different oil industry stakeholders and former DOE Secretary Zenaida Monsada were present during the presentation of five (5) new policies for the downstream oil industry: 1) DPNS/DOE QS 004:2017 CME-Blended Automotive Diesel Oil (ADO) Specification; 2) DPNS/DOE QS 013:2017 CME-Blended Industrial Diesel Oil (IDO) Specification; 3) Code of Safety Practices for LPG Refilling Plants; 4) Retail Rules; and 5) Philippine Downstream Natural Gas Regulation. These policies are aimed at protecting consumers and guiding industry players in offering better products and services. The sale of adulterated gasoline and diesel to tricycles and jeepneys in the countryside may soon become a thing of the past, according to Energy Secretary Alfonso Cusi. On Tuesday, Cusi presented new policies crafted by the Department of Energy (DOE) Oil Industry Management Bureau that would ease the establishment of gas stations in the countryside. Cusi said that the “bote-bote” system or sale of gas and diesel on soda bottles opens end-users to the purchase of adulterated fuel and exposes the public to the dangers of fire and explosion. The new policies under the downstream oil industry are intended to further protect consumers by enticing industry players to provide better services and products. The policies were unveiled as part of OIMB Day in line with the celebration of December as the National Energy Consciousness Month (NECM). Themed with the E-Power Mo campaign, the NECM highlights the importance of energy in the daily lives of the Filipinos and the country's overall economic development. “The Revised Retail Rules, The Philippine Downstream Natural Gas Industry Regulation and Handbook on LPG Safety Code in Refilling Plant are a welcome development in their respective sectors,” said Secretary Cusi. “We now have categories for gas stations that will encourage the putting up of safer products, facilities and services,” said Cusi. “We are also open to the various technology-options that are being introduced in the market to address the proliferation of liquid fuels in soda bottles or 'bote-bote'", he added. Cusi affirmed the need to cater to the dynamic segment of the transport industry, the tricycle drivers and operators and those living in remote areas. Cusi said the DOE drafted and endorsed to the Department of Trade and Industries-Bureau of Product Standards the new Philippine National Standard (PNS) for automotive and industrial diesel products in compliance with the standard specification under the Philippine Clean Air Act. The DOE-OIMB also separated the PNS for automotive and industrial diesel oil. The improved PNS/DOE Quality Standard (QS): 004:2017 on coco-methyl ester (CME)-blended Automotive Diesel Oil Specification contains revised technical provisions to upgrade the fuel quality requirement (such as reduced sulfur content limit in compliance with Euro-4 emission standard) and test methods for more accurate evaluation of fuel quality. The upgraded PNS/DOE QS 013:2017: CME-Blended Industrial Diesel Oil Specifications include introduction of cetane number or derived cetane number as new property, removal of distillation property, reduction in the limit of carbon residue, increase the limits of density, flash point and kinematic viscosity and updating of test method. Said standards aim to improve diesel quality for cleaner and efficient fuels sold in the market. Giving more protection to oil consumers, the DOE-OIMB issued the Code of Safety Practices for LPG Refilling Plant and updated the Retail Rules. These two policies are essential to safeguard the welfare of the consumers against unscrupulous trading of petroleum products (i.e., adulteration and under-delivery), said the DOE. They will also provide regulations on emerging and expanding technologies in the retailing of liquid fuels and more stringent measures for safe LPG manufacturing and use. Lastly, the DOE-OIMB also announced the issuance of the Philippine Downstream Natural Gas Regulation (PNGR), which provides standardized guidelines in the accreditation, operation, maintenance of natural gas infrastructures and facilities as well as its supply importation and transportation. The PNGR will also liberalize entry to the natural gas market and adherence of participants to international andj Philippine health, safety, security and environment standards. The policy will also allow Third Party Access to liquefied natural gas (LNG) import receiving facilities, Transmission and Distribution pipelines to create more players in the downstream natural gas value chain. Sony Pictures Television Networks, Asia scooped the pool at the 22nd Asian Television Awards in Singapore taking home five awards including the highly coveted ‘Cable & Satellite Network of the Year’. AXN, won ‘Cable & Satellite Channel of the Year’. The channel was also recognized for its hit-rated, pan-regional original production, The Amazing Race Asia Season 5, with three competitive awards: ‘Best General Entertainment Program’, ‘Best Reality Program’ and ‘Best Adaptation of an Existing Format’. “We’re celebrating SPT Networks’ 20th anniversary this year and the five Asian Television Awards we received is a testament to the incredible teamwork, passion and creativity that we invest in our network every day. As the leader in genre-defining channels, it’s in our DNA to know our viewers’ habits and then deliver compelling content to win their hearts, minds and screens,” said Virginia Lim, Senior Vice President and Head of Content, Production and Marketing, Sony Pictures Television Networks, Asia. The Amazing Race Asia Season 5 premiered in October 2016 securing AXN’s position as the #1 English General Entertainment channel in its Thursday night timeslot, with a 51% share of the genre. Hosted by TV personality Allan Wu, The Amazing Race Asia Season 5 was also the top rated original production of the year, which followed the adventures of 11 fearless teams who traversed Asia in a bid to win USD100,000. The Amazing Race Asia Season 5 was produced in collaboration with award-winning international production company, Profiles Television and globally renowned series creators Bertram Van Munster and Elise Doganieri. The Department of Transportation-Toll Regulatory Board (DOTr-TRB) issued last 29 November 2017 a Toll Operation Permit (TOP) to the Philippine Infrastructure Development Corporation (PIDC) for the maintenance and operation of the Binalonan-Pozorrubio Segment. In compliance with the Toll Concession Agreement, the DPWH, as well as representatives from concerned parties are set to open the TPLEX Segment 7, Section 3A-2 which stretches from Binalonan to Pozorrubio, Pangasinan. Segment 7approximately 10.10 kilometers is the second to the last portion of the TPLEX project that would be constructed by PIDC. Segment 7, Section 3A-1 of TPLEX officially opened last 28 July 2016.
, held January of this year at SM Mall of Asia Event Grounds gathered 12,000 runners. ColorManila, the country’s most aggressive ‘concept fun-run’ organizer, gears up for its biggest and most colorful event to date - the ColorManila Run Year 6, also known as CM Paradise Run, to be held on January 7, 2018, at the SM Mall of Asia Event Grounds, in Pasay City. CMR5, which was held January of this year, saw a record-breaking, sold-out event with 12,000 participants joining the race. The event also got international recognition and was a Finalist for Asia Sports Industry Awards in Bangkok, Thailand, for both the Mass Participation category and the Best Integrated Marketing Campaign for a Sports Event category. The event also got featured in various news outlets in 13 countries, including Malaysia, India, Turkey and Spain, among others. Only the best shall inherit. The Mapúa University Senior High School Student Council proudly presents the most bewitching, the most haunting, and certainly the most magical display of both beauty and brains any Halloween event would be ashamed to compare itself to. This annual display of exemplary qualities of a true-blooded Senior High School Mapúan popularly known as the Mr. and Ms. Senior High School pageant is set to be held this on December 13, 2017 (Wednesday), which will officially start at 1:00PM at the Mapúa University Gymnasium, open to everyone. Witness as the candidates showcase the culture and festivities of the pearl of the orient. 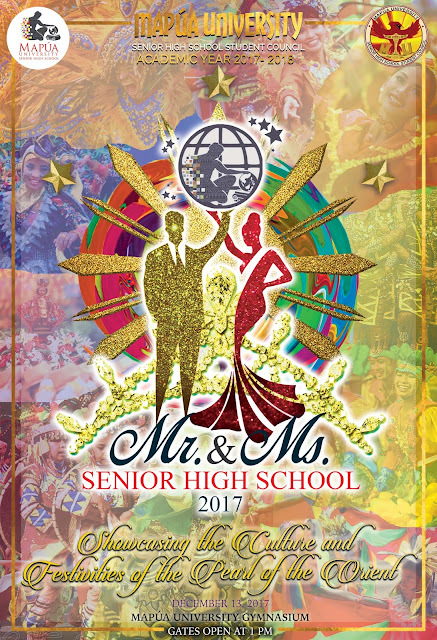 Considered to be one of the most anticipated events of the year, the Mr. and Ms. Senior High School pageant is a platform for the determined, the bold, and the confident dedicated in their mission to not only stupefy the onlookers, but to also inspire their fellow Senior High School Mapúans to action, a voice that can materialize out of obscurity and reach into the hearts of the Senior High School Mapúan community. And this year, with 32 candidates set out to fill that very role, a head that will fit the magnitude of the crown and all it entails, were chosen by undergoing a very rigorous and selective process that only the candidates who were able to exude confidence poised with elegance and grace were given the very privilege to join this illustrious event. The candidates were asked to do a sample runway walk, after which they were faced with one question, which was randomly selected, and were asked to state their take on the matter in front of the panelists who graded and ranked them accordingly. As papers were arranged and the list of candidates were finalized, the young hopefuls were then faced with the general rehearsals in preparation for the pageant, also a chance for them to mingle with other participants enabling with them to form bonds as well as share the gift of unity. The participants had to memorize choreography to both the official runway walk and their special number to be unveiled during the night of revelation. Are you all hyped up yet? Well, that much is expected, because this event is guaranteed to leave even a man of his word breathless and gasping for the right words; an event of glamourous proportions where only the best and nothing else can reach the top, where the crown and the title await the new king and queen, one made of guts, grit, and confidence, one that can swear by the mission that comes with the crown. The question remains, can the candidates make it to the top?